Make your exclusive Christmas celebration one to remember this festive season in London with a spectacular lunch party at this incredible Alpine Lodge.There’s never been a more unique way to round off the working year than with a themed party lunch at London’s original Ski Lodge and winter party venue. 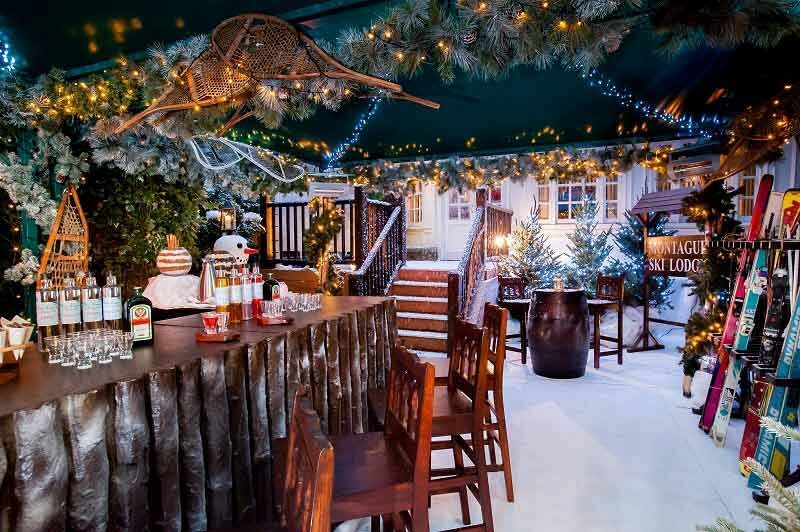 The venue’s wood deck will be transformed into a fabulous Winter paradise, with the Ski Lodge featuring pine trees, falling snow, reindeer, snowmen, ski racks, piste maps and strings of fairy lights and lanterns to set the atmosphere. On arrival, guests will enjoy a warming glass of mulled wine or mulled cider to get everyone into the spirit of things. For further drinks, head to the main bar which is the centrepiece of the venue; here, guests will be able to treat themselves to a wide selection of beverages, which includes a choice of 12 different Schnapps and vodka which will be sure to warm those cockles! 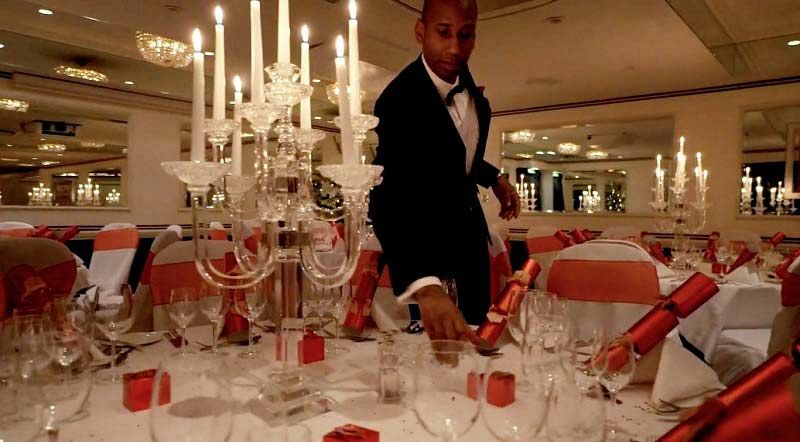 It won’t be long until guests are invited to take their seats and indulge in a sumptuous three-course festive feast. Lunch will be accompanied with a half-bottle of sommeliers selected red or white wine and a half-bottle of mineral water per person. Christmas novelties will also be included because no festive lunch with be the same without them! 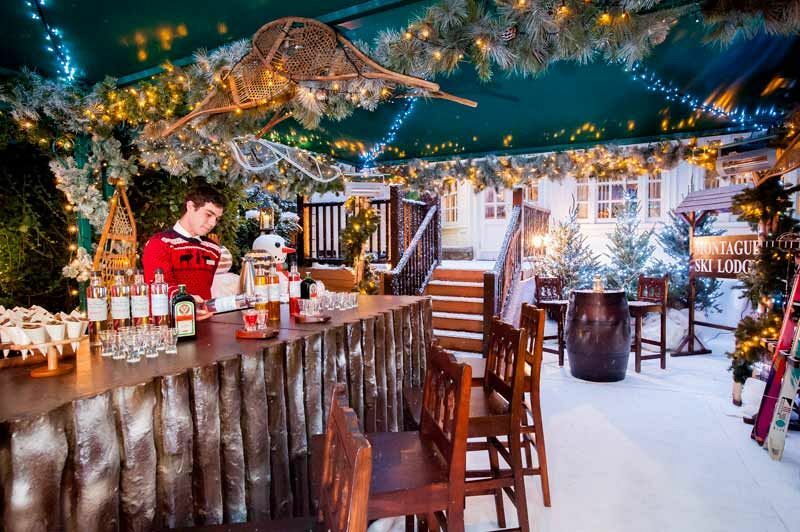 During the celebrations, guests will be able to combat the cold and lightly drifting snowflakes by enjoying some delicious candied pecans, mulled wine, hot spiced cider, mugs of steaming hot chocolate and cocktails, all whilst snuggled up on big woolly rugs. Alternatively, head to the log cabin, which features a beautiful decorative fireplace, Christmas trees and cosy armchairs with blankets. A DJ and disco will be available for groups that meet a spend of £10,000 on their booking, so get ready to drink, dance and have some festive fun at this unique and unforgettable lunch party! Send an enquiry through to the venue today!